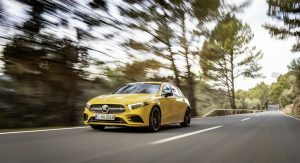 Mercedes has released the full details on their new hot hatch, the 2019 AMG A35, which also happens to be the cheapest AMG model you can buy. 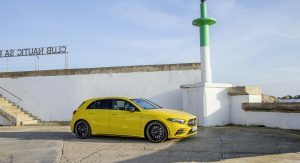 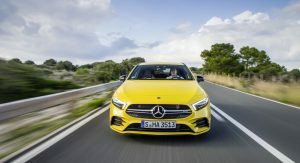 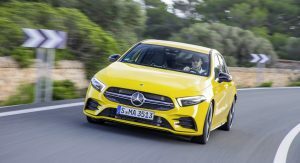 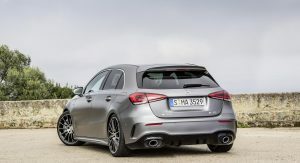 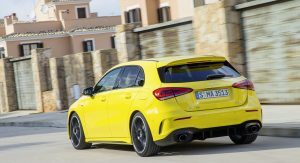 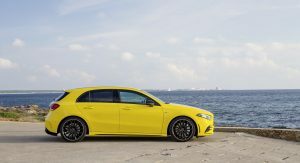 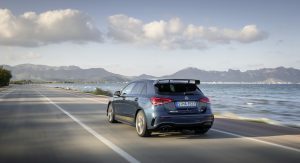 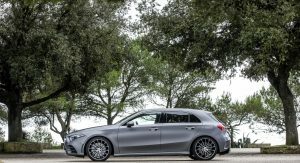 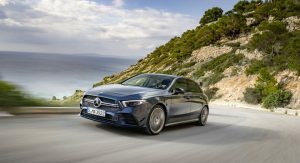 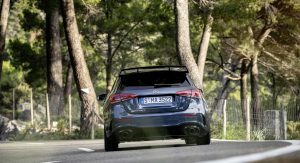 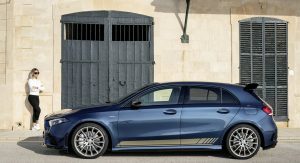 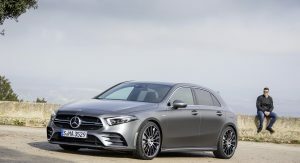 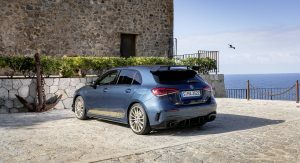 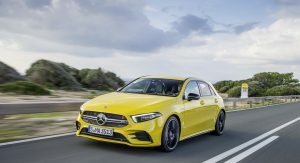 The new 2019 Mercedes AMG A35 is also AMG’s second take on a hot hatch, following the previous A45. 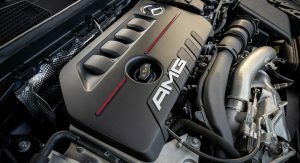 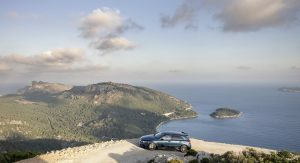 Power comes from a turbocharged 2.0-liter four-cylinder petrol engine with 301hp (306PS) and 295lb-ft (400Nm) of torque. 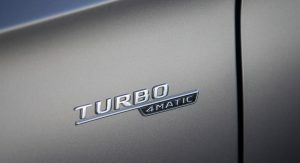 A seven-speed dual-clutch automatic transmission and all-wheel drive are also standard. 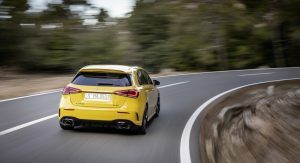 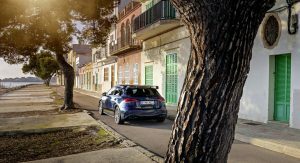 Marketed as a rival to the likes of the Audi S3 and VW Golf R, the new A35 is capable of a 0-62mph (100km/h) in 4.7 seconds, while top speed is limited to 155mph (250km/h). 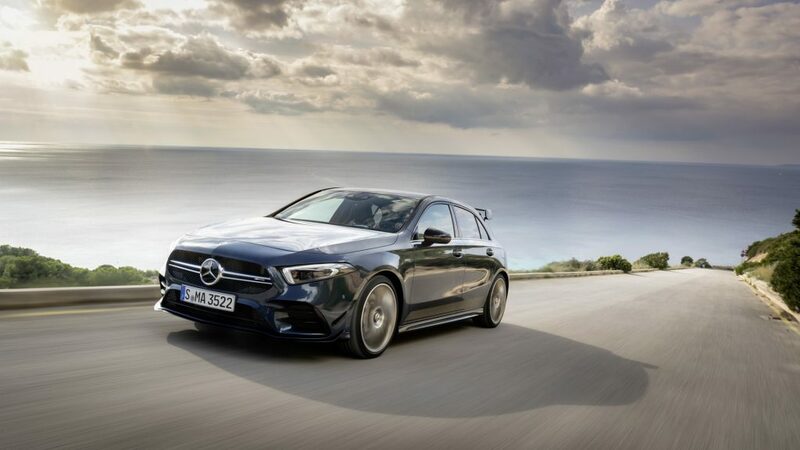 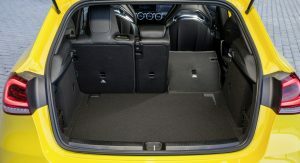 Since this is a proper AMG model, the chassis of the A-Class has been upgraded with a few goodies in order to perform better at its new duties. 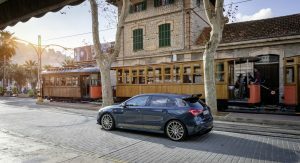 Things like an aluminum panel beneath the engine, along with some additional braces make the front end of the A35 stiffer, for better support of the suspension and the steering. 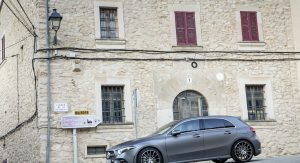 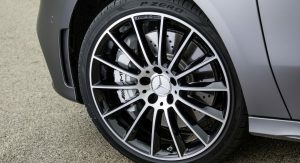 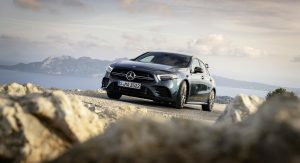 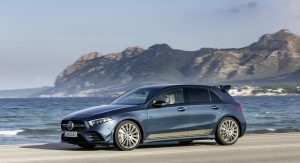 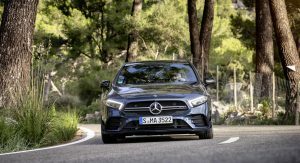 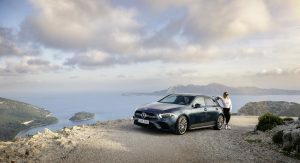 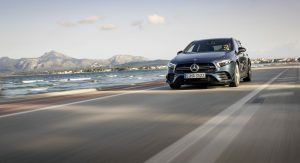 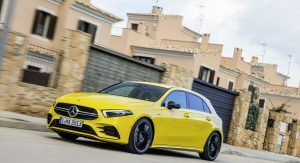 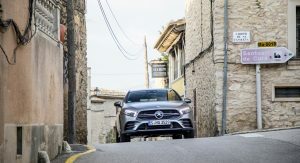 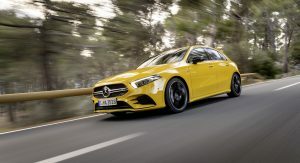 Add to that AMG’s Ride Control adaptive suspension, bigger brakes with four-piston calipers up front and perforated discs, and a speed-sensitive electro-mechanical steering and the fastest A-Class this side of an A45 is ready for action. 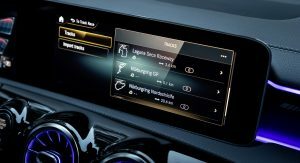 Drivers will get to choose between five different drive modes, including the new ‘Slippery’ mode. 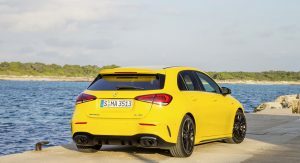 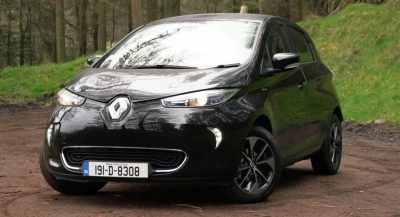 The new mode basically optimizes the car’s electronics for low-grip road conditions, offering smoother gear changes, reduced power, a flatter torque curve and earlier upshifts if you have the gearbox in Auto mode. 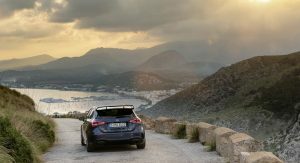 The most aggressive of the driving modes is the ‘Sport+’, which keeps the louder soundtrack of the engine in ‘Sport’ and doubles down with double-declutching during downshifts and partial cylinder cut-off for a more emotional driving experience. 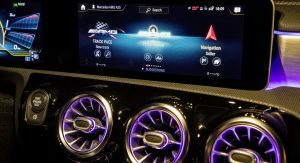 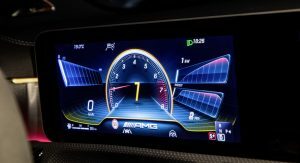 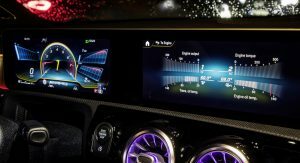 As part of the new MBUX infotainment system, Mercedes will offer the AMG Track Pace data logger as an option. 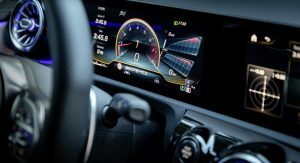 This records more than 80 parameters, including lap times, speed and acceleration, when driving on a race track. 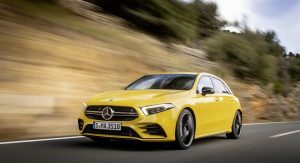 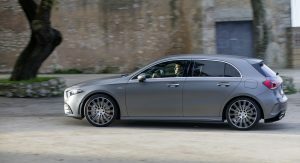 Finally, Mercedes will offer the AMG Aerodynamics Package as an option; the company has developed the more aggressive aero kit in the wind tunnel and claims that it doesn’t just make the A35 look meaner, it also improves handling at high speeds. 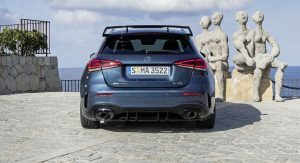 The package includes a larger front splitter and additional gloss black winglets, as well as a bigger fixed rear wing that increases downforce. 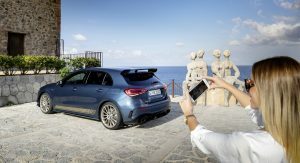 She has the money for an A35, but doesn’t own an iPhone X / XS / XR? 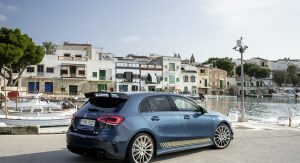 and starting at probably 40k, we have a hot hatch……….. 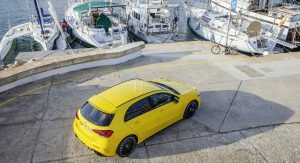 Cute little car, especially in that Yellow. 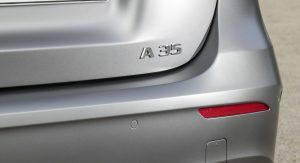 That said, I wouldn’t be interested in this for over $35k. 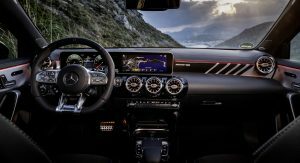 The value argument starts breaking down rapidly above that price point for me. 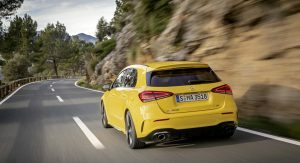 AMG A35 fully loaded is going be around $66K! 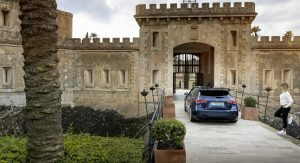 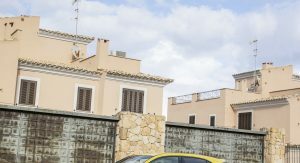 70,000 euros?? 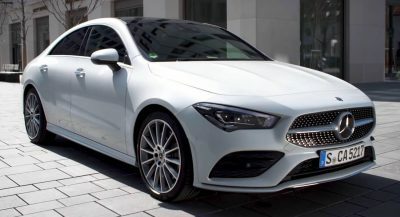 mercedes reps must be smoking really good stuff,damn. 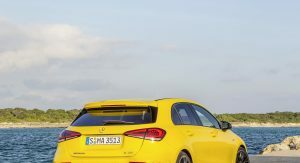 Not the yellow, the blue was ok. 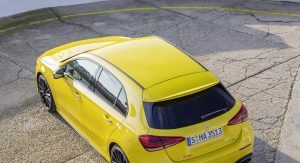 Still hate the long overhang on all new cars. 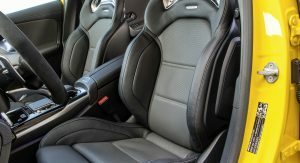 One of the best in that segment. 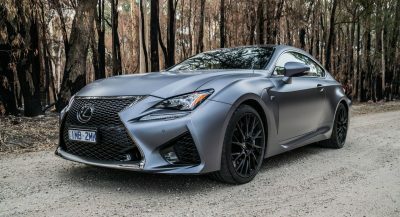 Lots of personality and an interesting design. 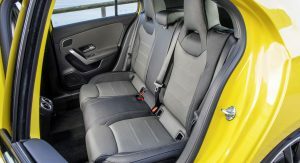 A tad weird in terms of interiors. 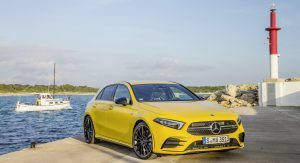 But not so weird to put me off. 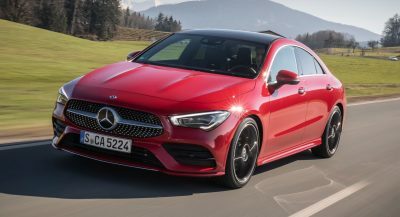 2019 car with an (at most) 2017 phone. 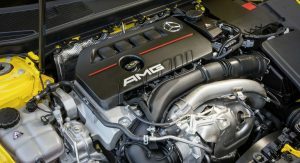 Do not believe this scenario. 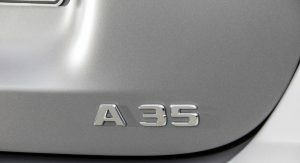 A35 order cancelled.